Faith formation teachers searching for good discussion material for adults and teens as well as a night outside the classroom would do well to take the group to see “Son of God,” a beautifully filmed movie about the life of Jesus from his birth, through his ministry, crucifixion and resurrection. The movie, due in theaters Feb. 28, comes from filmmakers Roma Downey and her husband, Mark Burnett, who created the 10-hour miniseries “The Bible,” which was a ratings success last year when it aired on the History cable channel. This time they bring the life of Christ, played by Diogo Morgado, to the big screen. Morgado, who also portrayed Christ in “The Bible,” turns in a compelling performance, capturing the charisma of the rabbi from Nazareth who attracts crowds by his preaching and performing miracles — actions that ultimately attract the attention of Temple leaders and Roman authorities, who ultimately feel threatened by Jesus’ ministry and message. The movie faithfully follows the Gospel narratives and features beautiful cinematography and an orchestral score from Oscar award-winning composer Hans Zimmer. Many of the actors from “The Bible” reprise their roles in “Son of God,” including Darwin Shaw as the devoted yet sometimes-weak Peter, Sebastian Knapp as John, Adrian Schiller as Caiaphas, Greg Hicks as a particularly brutal Pilate, and Downey as Jesus’ mother, Mary. While the beginning of the movie highlights many of the parables and scenes from Jesus’ early ministry, it’s the scenes from Jesus’ triumphant entry into Jerusalem through his crucifixion and resurrection that offer particularly powerful imagery, giving moviegoers much to reflect on as the Lenten season begins. In their efforts to create awareness and support for the movie, its backers have created an official website that features the film’s trailer, group and advance ticket information, a discussion guide and resources to help promote the film. The website also features a number of endorsements from religious leaders, including Cardinal Donald Wuerl of Washington, D.C.
On its website, the Archdiocese of Washington features catechetical video guides based on the film that have been prepared by Msgr. J. Brian Bransfield in conjunction with the the archdiocesan offices for catechesis and communication. Visit http://www.adw.org/sonofgod. 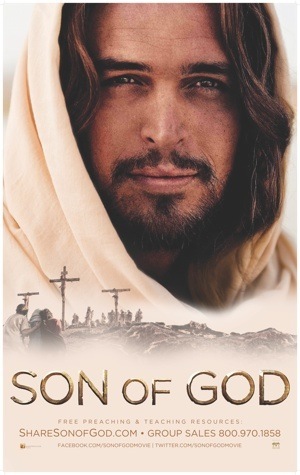 For a list of local theaters showing “Son of God” and show times, visit http://www.sonofgodmovie.com/advance-tickets.html. The Motion Picture Association of America rating is PG-13 due to some intense sequences related to the Crucifixion.